Show off your brewing prowess with this set of six cupping vessels! 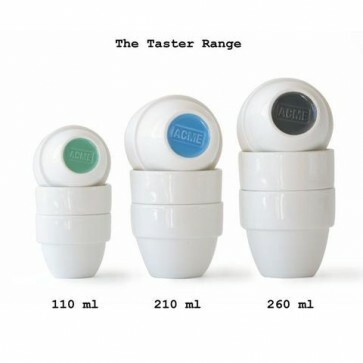 Just the thing to run your own blind tastings, each cup pair has a colored bottom indentation for identification. Cups are stackable for storage, and are sized for espresso (110ml), cortado (210ml), and full cupping (260ml) portions. Includes 2x Kokkako Blue, 2x Dolphin Gray, and 2x Feijoa Green Cups. Saucers sold separately. Dishwasher-safe.